The four African pangolins are: the giant ground pangolin (Smutsia giganteai); Temminck's ground pangolin (Smutsia temminckii); black-bellied pangolin (Phataginus tetradactyla); and white-bellied pangolin (Phataginus tricuspis). Pangolins have large, protective scales made of keratin (the same protein as hair, finger nails, rhino horn etc.) are also known as scaly anteaters. All eight species (four African and four Asian) are mostly solitary and nocturnal, and live either in hollow trees or burrows, depending on the species. Little data, but up to 20 years. 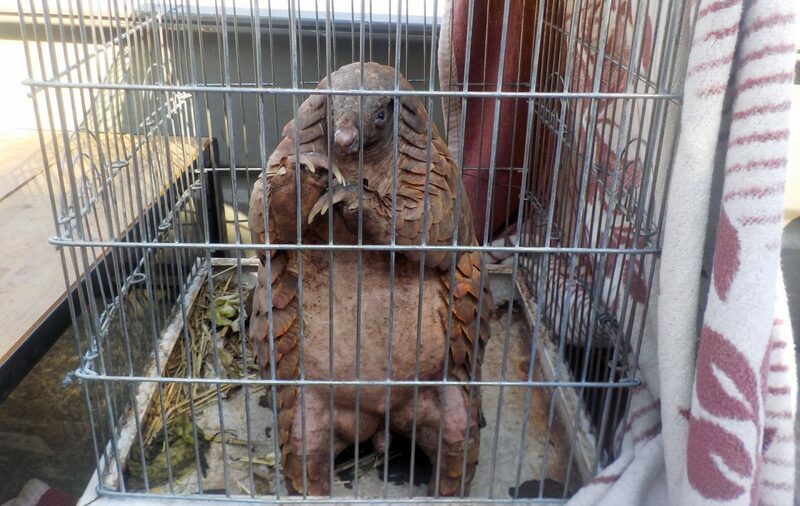 All four of Africa’s pangolin species are classified vulnerable. Because of their secretive, nocturnal behaviour, reliable data on the size of their populations is not available. All populations are thought to be decreasing. Temmick’s ground pangolin is the most widespread of the African species, in savanna woodland throughout much of Central, East and Southern Africa. The giant ground pangolin, and black-bellied and white-bellied pangolins are found in the forests of Central and West Africa. Pangolins use their long tongues to eat mainly termites and ants. Pangolins are the most trafficked mammals in the world, with their ground-up scales used in alternative medicine or their meat considered a delicacy in East Asia.